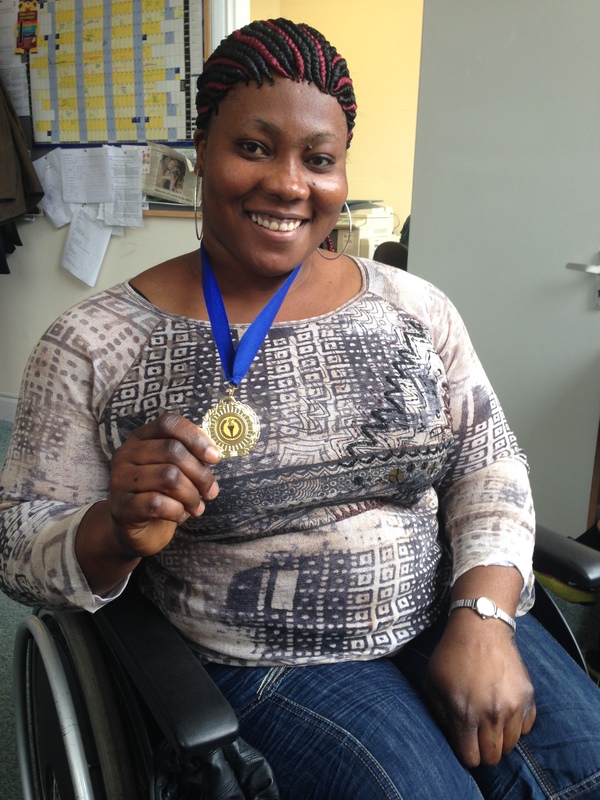 Big congratulations to Women Asylum Seekers Together (WAST) member Carine, who won a gold medal in British Weightlifting’s Para-powerlifting Autumn Open in Manchester on 3 October. Carine came first in the women’s heavyweight category, lifting an incredible weight of 126kg. She has been training as a powerlifter since 2009, and previously competed for the Ivory Coast in the London 2012 Paralympic Games. Carine is claiming asylum in the UK for political reasons and because life is very difficult for disabled people in her home country. She has been attending English classes at WAST for about a year, and Women for Refugee Women funded her transport to the Para-powerlifting Open in Manchester – the fourth powerlifting competition she’s competed in since arriving in the UK. Congratulations Carine, from all of us at Women for Refugee Women and WAST, on such a fantastic achievement.